Killer Characters: Where do you go? So... where do YOU go? I live in a tourist-type town right along the St. Clair River, in Michigan, so lots of people come to us to vacation. But where do you go to vacation when you live in a vacation town? This was easy when I was in university. I went to school across the border in Canada, and summer vacation in Southwestern Ontario means Wasaga, or Grand Bend, or some other Lake Huron playground. The beaches are nice, the people are friendly, and the night life is peppy, to say the least. But now, living back in Queensville, I find that I am so caught up in the local tourist attractions that when I think of vacationing, my mind goes blank. So, where do you go to vacation when you live in a tourist town? I'm open to ideas. I don't like crowds, and I'm not into high-priced shopping. I don't want to fly anywhere. Ideas, anyone? What is your ideal vacation destination in summer? Great vacation spot, Jaymie. And speaking of Canadian summer playgrounds, I'm heading up to the Muskokas, along with my writing pals, next week. We'll get some working time, some relaxing time, and most of all, lots of laughing time! Jaymie, go farther north in Michigan to Traverse City, Charlevoix, Petoskey, and Harbor Springs. That entire area is lovely. For a change of pace, spend a few days on Beaver Island, a pleasant ferry ride from Charlevoix. Not that there's anything wrong with a staycation! I'm a little jealous about the Canadian vacations! One of our favorite vaca places is Stowe, VT. Hiking, biking, kayaking, long walks, waterfalls, great food, quaint town... It's a nice escape. Oooh, the Muskokas, Erika!! Sounds great. 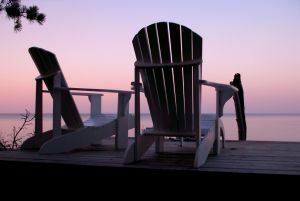 Did you know that Canadians call Adirondack chairs Muskoka chairs?? Janet, what great ideas! I've been to the Yoop, as Michiganders call the Upper Peninsula... beautiful. Heather... I would love to go to Vermont! But I think I'd like to go in fall for the colors. Good idea, yes? I am just returning to Michigan after a great 2-week vacation in the Smoky Mountains. A mountain vacation was really great - the area is so-o-o different from Michigan! And the weather was pretty great the whole time. I also recommend the Traverse City area and Wisconsin Dells. Since I live in the mountains, naturally I long for the beach! The Smoky Mountains sound wonderful! And doesn't everyone long for a beach in summer? ?